Friday: Sun fades, afternoon and evening rain and thunder. Highs around 60. Overnight Friday Night: Showers and fog. Lows in the 40s. Saturday: Early patchy fog to sun. Mild with highs near 70. Sunday: Occasional showers. Highs near 60. Low pressure that was in Georgia on Thursday is racing toward Connecticut on Friday. Temperatures quickly warm to 60 degrees or higher Friday morning, and then begin to fall back with clouds in the afternoon. 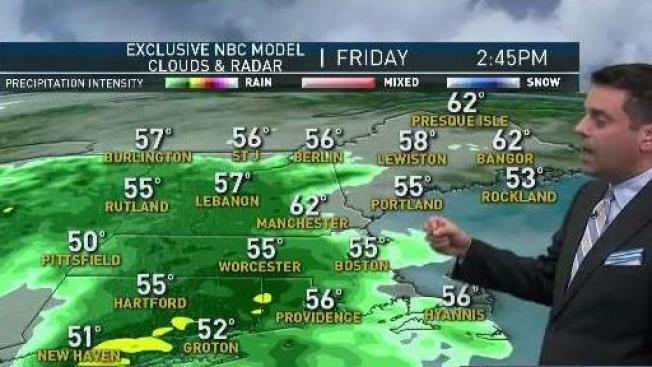 Rain arrives in southwestern Connecticut by 1 p.m. and advances quickly to most of western and southern New England by 5 p.m. It is quite an energized, small low pressure system that could bring downpours and even a thunderstorm across New England for about a six hour period through sunset. It may be a challenge getting a Red Sox game at Fenway Park in Boston. Rain shuts off from southwest to northeast Friday night, followed by patchy fog to start our Saturday. We are between fronts tomorrow, with a mix of sun and clouds and a chance for a shower or thunderstorm in western New England during the afternoon. High temperatures near 70 degrees in many locations. That front crosses with showers to the east at night into early Sunday, with cooler air coming in for the second half of the weekend. Sunday will be a mixture of clouds and sunshine, with an instability shower, or even snow shower in the mountains. But most of the day is dry with highs in the 50s to low 60s. The upper level low causing all these instability showers is still here on Monday with highs near 60 degrees. Tuesday brings warmer air in from the southwest, getting us to near 70 degrees. Wednesday and Thursday should feel like summer with. temperatures near 80 degrees, before the next front comes in with showers and thunderstorms later in the week.